The last few months I have been working with customers in lands where they don’t speak English as a first language. This has helped me better understand what my Japanese teachers said and did as they taught kaizen in the U.S. It has also given me some clues on why Lean emphasizes the visual aspect so much. Just like my Japanese teachers, I am spending a lot of time drawing sketches and using non-manufacturing examples from real life to explain Lean concepts. These can be powerful, common sense examples such as “Would you watch a washing machine run at home? Then why do you have to watch you CNC lathe run in the factory?” Some of these sketches and examples can border on the silly, and this has the effect of making people relax so that they are willing to learn. Lean is very visual in nature. The goal of 5S is to create standards of what is normal in the factory so that waste is made visible. Many of the tools such as TPM, andon lamps, and kanban emphasize the visual aspect. While traditional manufacturing managers tend to manage through reports, dashboards, and computer screens Lean managers manage by going to the floor and seeing if work is flowing one at a time to takt. This can happen after the process has been made as simple as possible (one-piece flow) and standard work has been established. In a Lean factory words should not be necessary. Processes should be simple and direct so that visual management of abnormality is at a glance. A takt counter or clock displays how often a product should be finished and started to meet customer demand. Hourly production boards show the status (progress and delay) of work. While it can be an effort to set up and maintain these visuals, it makes it possible to manage visually, without words. If you had to teach someone how to implement Lean without using words, how would you do it? You would use pictures, drawings, examples as much as possible. 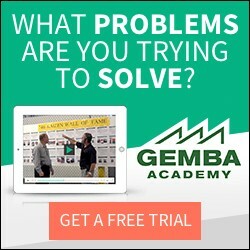 You would take their hand and go to the Gemba and help them see. The ‘genchi gembutsu’ principle is extremely important to help people see what actually is, rather than what people think. Just as my Japanese teachers would day “just do it!” I found myself taking the team to the factory to pick and deliver material to the assembly line as an example of timed material replenishment in exact quantities. One hour of demonstration was far more effective than a day of discussion. There is no point in debating opinions with people from different countries about how best to run a manufacturing operation. Even without gaps in language, the cultural gaps make debate nearly pointless. This is because one culture may expect that when logic prevails and the debate is done, the losing side of the debate will do what is logical. I have found that this is not so in many cultures. When it comes to how a factory should run, the basic assumptions behind a debate (value of work vs. family, following rules vs. working from trust, respect for the group vs. respect for the individual, etc.) need to be understood first when you are working in different cultures. Even if you understand them, you are most often helpless to change them. So once again debate and discussion is pointless. Adult learning theory says that people learn by doing, and they accept the new things that they learn when they can make it their own and see value in what they are creating. This is a full-body activity, and not a verbal and mental activity. Luckily Lean implementation through kaizen makes this easy in any language or culture. Another important point is that there is simply no point in debating Lean operations vs. batch & queue operations with anyone in any language. The two are simply completely different ways of thinking. Until the necessary ground rules of Lean (takt time, one piece flow, downstream pull, built-in quality, standard work, and jidoka) are understood by both sides the debate is like making soup without water or fire. The best way to respect the experience and opinions of others but to avoid debate is to listen and as “why” as often as possible. Most of the time managers of non-Lean operations will be stumped after 3 or 4 rounds of “why” and will be willing to listen to any better ideas you may have. This is probably where the “5 Why” root cause analysis tool came from. So are words useless in teaching Lean? Probably not completely, but mostly. If as a facilitator of a kaizen event you spend much more than 15% of the time talking instead of showing or doing, you are probably limiting the effectiveness of the kaizen team.